This is a really interesting idea, but it was met with mixed reviews in this house. The problem with this dish is kind of a basic one – if you like the texture of bread products cooked in a liquid – like dumplings – you’ll like this. If you don’t – which my husband doesn’t – you definitely won’t. In the pan this looked lovely and golden. My casserole pan was a little tight for the recipe, though it was the size recommended. My suggestion would be that if you are going to try this dish, upsize your pan! Either that, or use one that is wider and shallower but the same qt. size. 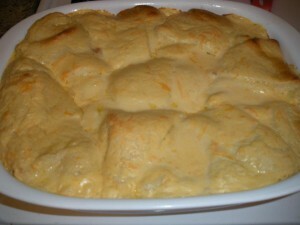 It will allow things to cook more evenly if the dish is more spread out, and you won’t risk it bubbling over the sides! It may also help with the “dumpling” texture that the crescent rolls take on. Richard didn’t want to ever try this recipe again, so I haven’t had the chance to experiment with it! On the plate is where this really fell apart. Yikes! It was so sloppy and saucy – the rolls didn’t stay “stuffed” at all, but oozed everywhere once out of the pan. It was kind of overwhelming. I mean, I like saucy as much as the next girl, but we all have our limits. This was not casserole texture. More like chunky soup – yes, I do mean the kind from the can – texture. I ended up giving this 3 stars because the flavour was there, even if the execution was a bit messy and ugly. If the flavours could only be translated into something solid. And pretty. Then this would be something else… if you experiment with the recipe and have better results – let me know! 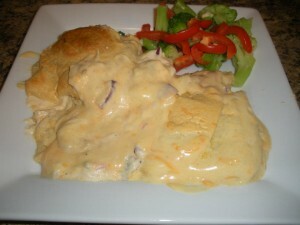 3star Casserole Chicken What's for dinner?